Latinos in the United States who grow up in a home where both Spanish and English are spoken often speak a type of Spanish called U.S. Spanish — or Spanglish. In academia, they are known as heritage Spanish speakers. During Hispanic Heritage Month, St. Mary’s University in San Antonio and St. Edward’s University in Austin have faculty and students who are working to highlight the importance of U.S. Spanish as a valid, useful form of Spanish. This often overlooked and sometimes ridiculed form of Spanish gives its speakers a strong cultural and language foundation that should be cultivated, academics say. A growing trend among universities is studying both the linguistics of U.S. Spanish, as well as offering heritage Spanish courses to help heritage speakers improve their language skills. Associate Professor of Spanish Meghann Peace, Ph.D., and a colleague at the University of Calgary examined the types of attitudes present among heritage speakers of Spanish at St. Mary’s University and at the University of Calgary, as reflected through the linguistic research that they carried out in the community. Peace and a colleague at the College of New Jersey also studied the attitudes of heritage speaking students while studying abroad in Madrid. 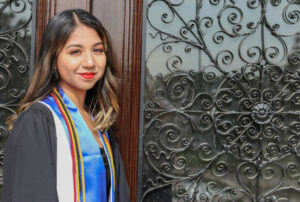 A recent alumna, Michelle Michimani Leyva (B.A. ’18), completed a project on Lexical Variation of Spanish speakers, which was featured in the Summer 2018 Gold & Blue magazine. Emily Bernate is elevating U.S. Spanish through studying politeness techniques of U.S. Spanish speakers.